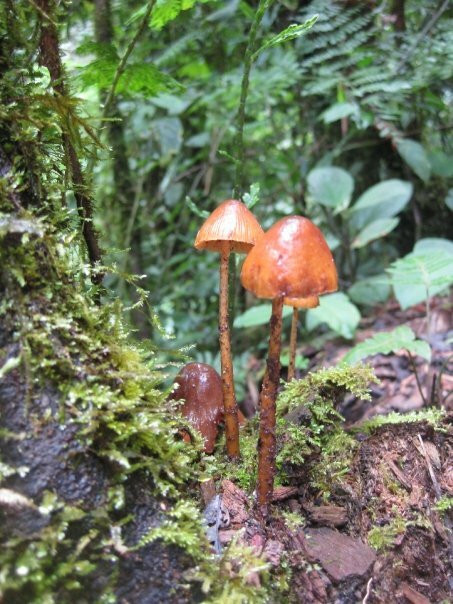 After spending a much needed week at the beach it was time to head to the mountains/jungle and walk through the cloud forests. On the itinerary, Arenal and Monteverde before heading back to the good ole' USA. 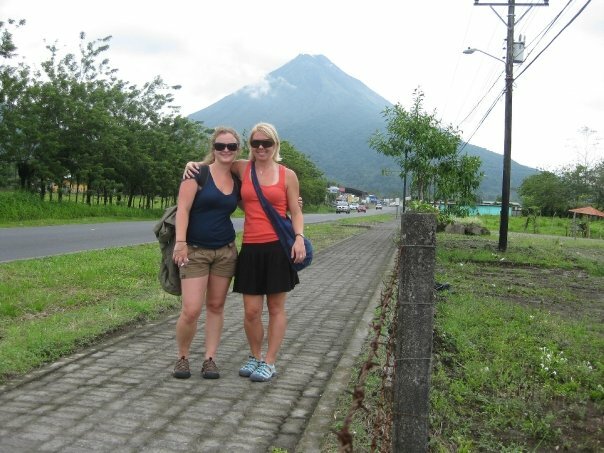 Instead of staying in Arenal we actually stayed in the town La Fortuna, which means the fortunate ones. 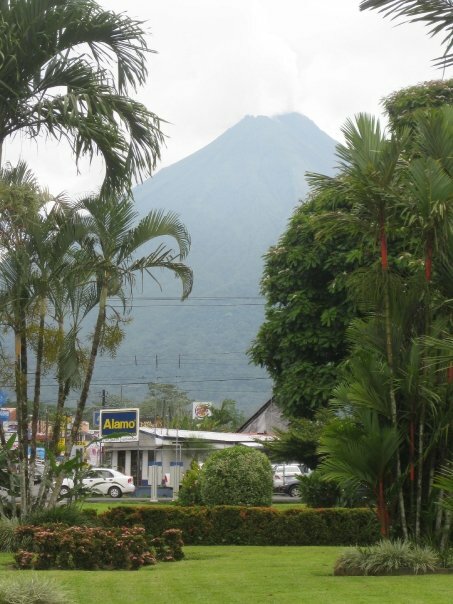 As story has it when the Volcano erupted in 1991 this hill town was untouched so they renamed it, La Fortuna. We decided to go against our guide book's recommendation and stayed at a hotel which was recommended by someone in Tamarindo, The Vagabondo. Once we arrived we were greeted by the owner who checked us in and showed us to our room. The room was brightly colored and very spacious. For $40 a night we each had a queen size bed, hot water, a typical Costa Rican breakfast (eggs with rice and black beans), AC, TV, Hammocks, and even a swimming pool. The atmosphere felt more like a B&B than a hotel. The next morning we even saw the owner cleaning the pool. The Vagabondo is highly recommended. After settling into our room it was time to get moving and book some tours. We decided to go with Jacamar Tours, they seemed to have some of the best tours at reasonable prices. So we wondered into town grabed a bite to eat and planned out the following days. Another shot of the Volcano from La Fortuna. Through Jacamar we booked a night Volcano tour, river float and our Jeep-Boat-Jeep transfer to Monteverde. We lucked out on both tours. The guided Volcano tour was just Erin and I with one other person and the guide. Our guide was extremely knowledgeable. The float was a private tour, we lucked out again, no one else had booked this tour. (note: we were there during the rainy/slow season) Again our guide was extremely knowledgeable and we were able to see animals from monkeys to lizards that walk on water. The float was wrapped up with coffee, cake, plantains, and homemade cheese at a typical Costa Rican house. 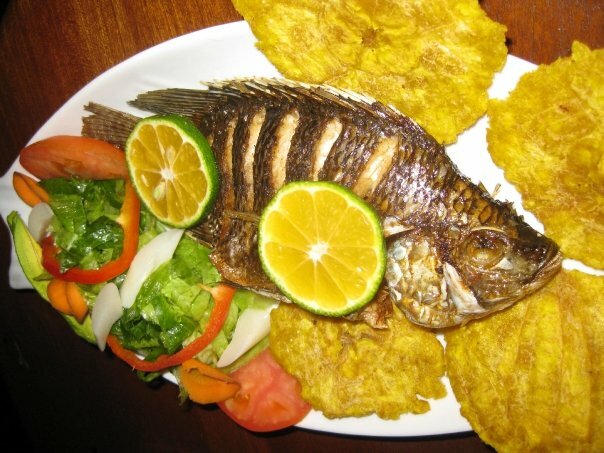 Dinner..Hmm... A typical Costa Rican Fish plate. After a day and a half in La Fortuna it was time to head to Monteverde for zip lining and cloud forests. The Jeep-Boat-Jeep transfer only took at 3-3 1/2 hours, not bad however the roads aren't the greatest. Again we opted not to stay in Monteverde, but in the town Santa Elena - which was about 3 blocks big. We also went off another personal recommendation and stayed at the El Sueno B&B. It wasn't as impressive as the Vagabondo, but it got the job done. For $30 a night we had hot water (once we figured out how to turn it on), breakfast, a TV in the common room, and plenty of blankets to keep us warm. Yes, we needed them it got cold at night. 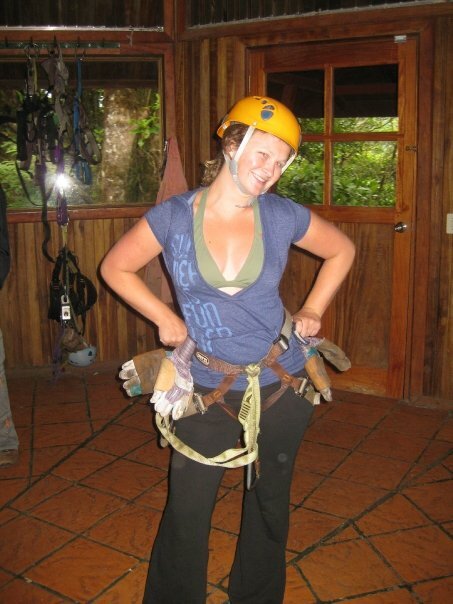 Erin getting ready for zip lining. We were able to book many of the tours through the hotel which was nice. The first night we went on a guided night walk. It was amazing running through the jungle seeing spiders, lingo's, raccoons, sloths, and birds. The second day we went zip lining and canopying high above the jungle. We were able to finish the 18 zip lines, tarzan swing, and 10 canopy bridges right before it started to rain and I mean down pour! Talk about perfect timing. Over looking the jungle while crossing one of the 10 bridges. The last day in Monteverde/Santa Elena we had nothing booked, so we decided to hike up to the Monteverde Cloud Forest Reserve and do some hiking. We decided on two different loops that took a total of 3 hours. First we hiked from Santa Elena then hiked around the reserve. After hiking around and checking out the continental divide we headed back to town before heading out the the Don Juan coffee plantation. By the end of the day we had walked/hiked 17 miles. 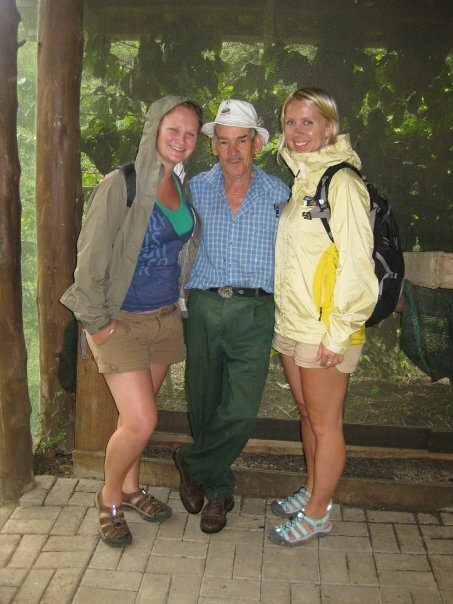 With the real "Don Juan"
After all that hiking we were hungry. 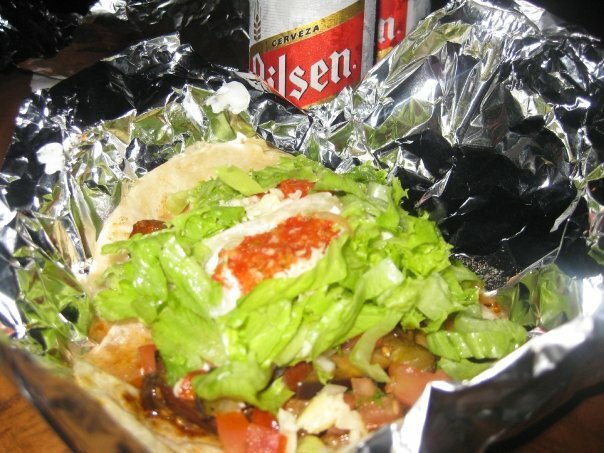 We grabbed a couple of beers from the supermarketo and stumbled to the taco stand. It was probably one the best meals we had the entire trip. Goodbye Costa Rica - Right before boarding the plane for the states.